Jake and I are back from Melbourne where we were one of hundreds of open-source spatial software enthusiasts attending last week’s FOSS4G SotM Oceania conference. This is a regional Oceania-focussed event supported by the OSGeo Foundation (OSGeo) and the OpenStreetMap Foundation (OSMF). Gaia Resources were also a sponsor and contributed to the ‘Good Mojo’ program which helped to fund travel costs for international delegates from developing countries. What the heck is FOSS4G you say? It stands for ‘Free and Open Source Software for Geospatial’ – and has been used for over a decade as a label for OSGeo’s international and regional conferences. In case you are wondering, SotM is an acronym for ‘State of the Map.’ We love our acronyms in the spatial industry! Q. What made you decide to go across the country for a software conference? Chris: As a Project Manager and a Spatial Analyst it was important for me to understand the emerging open-source technology components involved in so many of our projects and how different groups were using them, because I think this helps when providing advice to clients and getting a better connection with our developers. I love those rare moments in conversation when my colleagues raise their eyebrows and realise, yeah, I do know a little bit about the tech. Plus it also tied into a Georabble event where we gave a talk based on our previous threatened species blog! 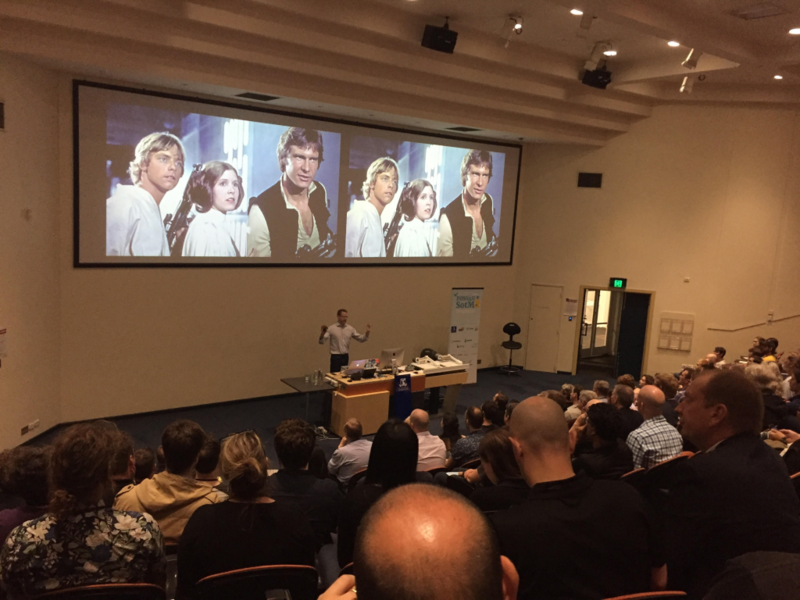 Star Wars ‘heroes’ references featured in several FOSS4G presentations. This one is from Paul’s keynote address alluding to open-source software contributors. Q. Was there a talk that really gets you thinking even days after the conference finished? 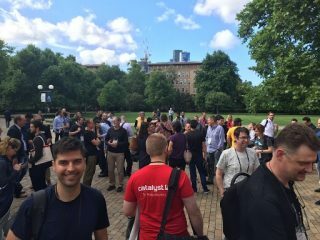 Chris: There were a few actually – I was surprised how business-focused many of the talks were compared to some of the off-the-shelf spatial conferences I’ve been to. First of all I thought I was going to be deluged with technical detail, but that wasn’t the case. I guess the bespoke nature of the solutions they were showcasing stemmed from them developing to solve a specific challenge, and only after they had analysed the requirement and understood the nature of the beast. That was quite thought-provoking. The opening keynote address from Paul Ramsey (“co-founder” of PostGIS) has given us plenty to ponder. Paul has given a similar talk every 2 years to FOSS4G, and lets us in on what keeps open-source software going. He tells us that open-source software only survives if it gets continuous attention (he calls this the Attention economy), and that open-source developers also build up attention capital when they contribute to the product and help out their fellow community members. They become heroes of sorts, and can call on the help of others in times of need. The cash economy in open-source software is limited – in part because it is um, free – but there are organisations that donate and others that hire core developers to build specific modules or plug-ins to suit their pressing needs. Paul also points out that the value that open-source software provides organisations is something that is underestimated, if not even ignored. I still love the comment that many managers look at software like QGIS and think of it as fairy dust. The message here seemed to be, if you really like if and want it to stick around, give back to the community. Jake: There are two that have stayed with me since the conference. Kate Crawford’s talk on Moving Through Country: A Community Based Project to Map and Share Indigenous Cultural Perspectives and Kiersten Jowett’s talk on Blockchain is knocking. Will FOSS4G answer? Both were very different but the underlying themes and messages could potentially converge in the future. Kate Crawford’s project takes a really simple mapping platform (OpenStreetMap) and their team are endeavouring to engage with regional communities in order to build up a wealth of cultural knowledge. There is also the idea for mobile applications, a website, 3D topographic maps, and virtual reality. Kiersten Jowett’s talk introduced us to Blockchain and its relationship with Cryptocurrency and Miners. They want to dispel the many sceptics and bring Blockchain technology into the open source geospatial community through companies like FOAM, Helium, XYO, and Platin. It is a young and exciting technology and if it used thoughtfully, could be a game changer. Q. Is there anything you learnt that you want to get stuck into straight away? Chris: Nyall Dawson ran us through a new plug-in called SLYR that I really want to try. This is a style conversion utility for taking those complex symbology libraries from ArcGIS and converting them to QGIS. So for those layers that have hundreds of colour, patch and marker combinations this should make short work of them. I know a few people who are going to get excited about this one. Shout out to SMEC for bringing Nyall on to give that back to the QGIS community. Jake: The python workshops were an eye opening experience into the many capabilities between QGIS and Python. There is most definitely an opportunity in this space to create smoother workflows, unique tools, and automated tasks. Q. What was the most inspiring thing you heard while you were there? Chris: Ooh tough one. Rohan Fisher’s discussion about empowering regional governments in Indonesia with Saga and QGIS training was one that I thought was rather inspiring. When Anne Harper from Koordinates started asking us to think beyond open data portals and consider the full customer experience of open data, I felt she was really onto something there – open data should be more than a click and download approach and there needs to be tools and products to help a wider audience understand what they are grabbing and to help them achieve the outcome they are after. Jake: Nathan Woodrow’s talk on The evolution of a homegrown QGIS developer showed just how easy it is to get involved in the open source community, specifically QGIS. He went through some life events that had an impact on his QGIS development work, all the while still contributing. It also has to be said that the work put into QGIS was outside of work hours, which just goes to show the commitment and passion he has for this GIS application and the open source community. Q. Tell us something funny or embarrassing about the trip. Chris: We ran into Nick Middleton from Western Australia on the first night ice-breaker drinks and proceeded to “network” until past midnight, only to start the conference a bit bleary-eyed at what was effectively 5:30am Perth time. So a great start, and a really good chance to catch up with one of our former GRID clients. He was also cheering us on at our Georabble presentation a couple nights later (which was a recap of our Threatened Species work we blogged about previously) so thanks for the support mate! Jake: Surely it would have to be the fire alarm incident. The conference was about to kick off, we were being given introductions to the schedule and venue then…..BAM! I think everyone presumed it was a joke until we were instructed to proceed out of the doors and onto the grassed area. It was however a great opportunity to take a group photo. Q. What does open-source mean to you? Chris: Well, my understanding is broader now that I have been to this conference. To me open-source is about freely available software, data and tools supported by a community of people who want to share their knowledge and experience with the rest of the world. Government plays a big role in the evolving open data space in my opinion, so the public and businesses can continually derive value from their information assets. Flipping the question on its head, I’ve also realised what ‘We’ should mean to open-source, in that it is only through our contributions and support that software like QGIS, PostGIS, Geoserver, Leaflet, Django and all those gems on GitHub out there thrive and improve over time. Jake: Open-source has stuck with me ever since my university days. I was amazed at the level of these products and the contributions made by the online communities. Open source also gives everyone the opportunity to engage with products they might not usually have access to. Other words that spring to my mind and should for others are collaboration, innovation, creativity, and openness. Q. Will you go next year to Wellington, and what do you hope will be new or different there? Chris: I would like to go, but I would also like to give others in our team a chance to experience it. I think if I could see something focused on next time, it would be about open-source software accessibility and uptake challenges for non-developers. I feel there is a steep learning curve for those of us who can’t read code like a book – QGIS and perhaps Saga being the major exception where a lot of attention has been given to the user interface, tools help and documentation. Jake: Of course I would love to! I don’t think the open source community is ever short of innovative ideas with the growth of Geospatial free and open source software, so I’m certain there will be some new technologies being explored as well as previous projects taken to a new level of awesomeness! Note that many of the video recordings are available at https://foss4g-oceania.org/videos and photos from the various events can be viewed at https://foss4g-oceania.org/photos. Jake and I would be keen to hear what you think on any of these topics, or to catch-up if you were one of the attendees we didn’t get to speak to. A conversation can also be started on our Facebook, Twitter or LinkedIn accounts – or drop us a line on (08) 9227 7309 or email me on chris.roach@gaiaresources.com.au.